Queen Anne’s reign lasted from 1702 until her death in 1714. The Favourite covers the period between 1704 and 1711 and details the backstabbing, double-dealing, and manipulation characterizing the relationship between Sarah and Abigail. When a penniless Abigail arrives at court, she is initially taken under her cousin’s wing. Her introduction to the queen occurs when she devises an herbal remedy that can be used to cool the heat and pain from Anne’s gout. Thereafter, with Sarah initially oblivious, a friendship between Anne and Abigail develops. After spending a night in Anne’s bed, Abigail sees an opportunity to unseat her rival and, with Sarah still not aware of the depth of Abigail’s ambition, the next blow falls hard. The Favourite dabbles in Parliamentary politics; Sarah is a known Whig sympathizer and Abigail favors the Tories. Both therefore have powerful allies. Sarah’s husband, Lord Marlborough (Mark Gatiss), is the commander of British armies in the War of the Spanish Succession and the Earl of Godolphin (James Smith) is the Lord Treasurer. Abigail is backed by the most powerful Tories, including Robert Harley (Nicolas Hoult), Earl of Oxford. Although a majority of the film focuses on the moves and counter-moves of Sarah and Abigail to retain the queen’s approval and affection, the struggles between the Whigs and Tories are never too far in the background. Perhaps owing to his directing from a screenplay he didn’t write, Yorgos Lanthimos’ third English-language feature is easily his most accessible. It’s not as openly weird as The Lobster (which featured Rachel Weisz) or The Killing of a Sacred Deer. The film features some distinctive camerawork, including the occasional use of a fisheye lens whose distortion emphasizes the strangeness of the royal bubble in which the main characters are captive. There’s also a visually striking moment when it appears that Abigail, sitting demurely in front of a painted wall, is part of the scenery. Lanthimos emphasizes the lushness and opulence of the palace as a counterpoint to the question of whether taxes should be raised to fund the war. 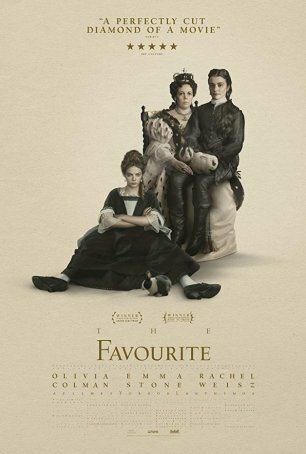 The Favourite’s strength lies in the acting of the three leads, all of whom have received widespread praise for previous roles. Emma Stone brings a seeming vulnerability to the viperous part of Abigail, the seeming innocent whose heart is less than pure. Not for the first time, Rachel Weisz exudes a cool regality as the domineering Sarah. The real star, however, is Olivia Colman, the only one of the three not to have been honored by the Academy (Stone and Weisz have won Oscars for La La Land and The Constant Gardener, respectively). Colman plays the role straight, without a hint of irony and, as a result, fashions a tragic figure. The sadness of Anne’s plight is deepened by her lack of awareness about how ruthlessly she is being manipulated by the two women who are supposed to love her. According to Lanthimos, two films he drew on for direct inspiration were Amadeus and Cries and Whispers. The psychological echoes of those movies are evident in the way Sarah and Abigail warp and manipulate Anne’s perspective. Although The Favourite can be classified as a dark comedy – it certainly contains all the marks of one – it also functions effectively as a tragedy. For those with a taste for historical fiction, The Favourite is a delicious morsel with a spicy aftertaste.